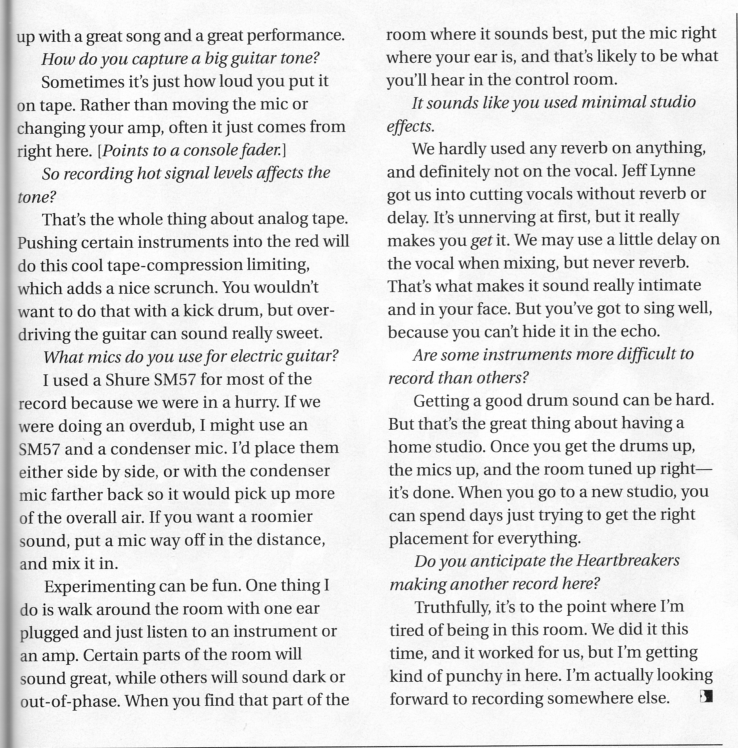 Editor's Note: Thanks to Susan Molls for lending me this magazine for scanning. After more than two decades of crafting hit records and packing concert halls and stadiums, Tom Petty & The Heartbreakers are certified superstars. But, compared to say, the Rolling Stones or U2, there's something more down to earth about the Heartbreakers. Perhaps this is due to the vivid realism of Petty's lyrics, or the band's unpretentious, blue-collar sound, or the stark authority of Mike Campbell's guitar playing. One thing is clear: The Heartbreakers' songs still resonate with their fans, many of whom have supported the band since it burst on the scene in the late '70s. 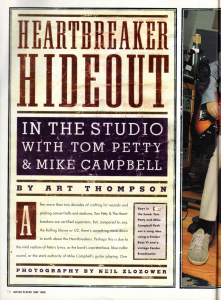 GP hooked up with Petty and Campbell at Campbell's West Los Angeles home studio. The party began with Campbell playing a one-off, pre-release CD of Echo, the Heartbreakers' new MCA album. "You're the first to hear it," he said. "The song order isn't even finalized." 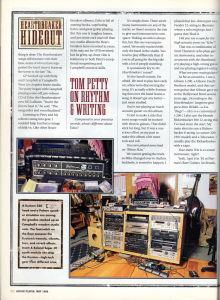 Listening to Petty and his cohorts swing into gear, I couldn't help but feel a twinge of deja vu. Like other Heartbreakers albums, Echo is full of soaring hooks, captivating lyrics, and great guitar playing. But this one is tougher, leaner, and just more rock and roll than any studio album the Heartbreakers have recorded in years. 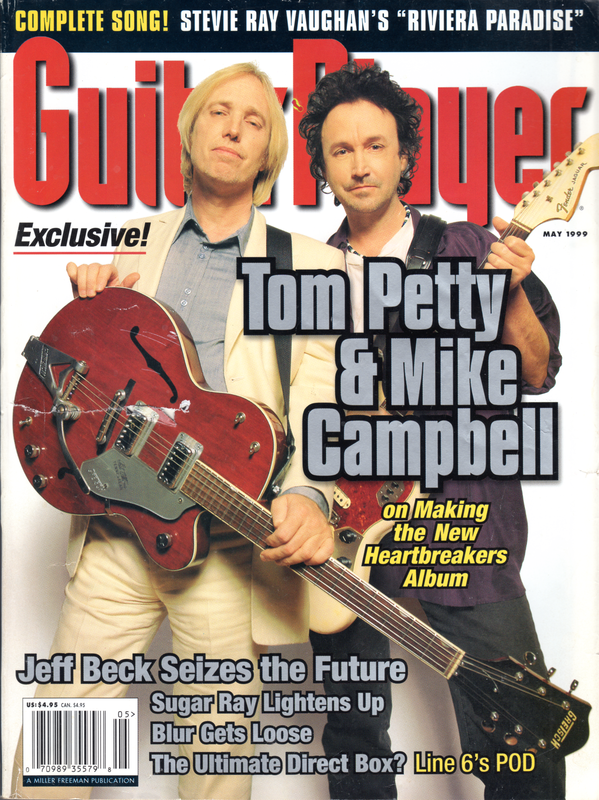 Echo might not be 1978 revisited, but its gritty, up-front vibe is testimony to both Petty's exceptional songwriting and Campbell's musical skills. Compared to your previous records, what's different about Echo? It's simply done. There aren't many instruments on any of the tracks, so there's room in the mix to give each instrument its own space. Making records is always fun, but this one was unpressured. We mostly tracked with only the band in the studio. You tend to play different than if you're all going for the big take with a lot of people watching. Is spontaneity key to the Heartbreakers' sound? It's the band's nature, I'm afraid. We tend to play best early on, when we're discovering the song. It's actually a little frustrating that once the band learns a song, it doesn't get any better -- just more studied. You're not playing as much acoustic guitar on this album. I tried to make a rule that most songs would be tracked with electric guitars. That didn't stickl for long, but it was a conscious effort on my part to make this album a bit more rock and roll. You even played some lead on "Rhino Skin." We weren't getting the track, so Mike changed over to rhythm. Suddenly, it started to happen. 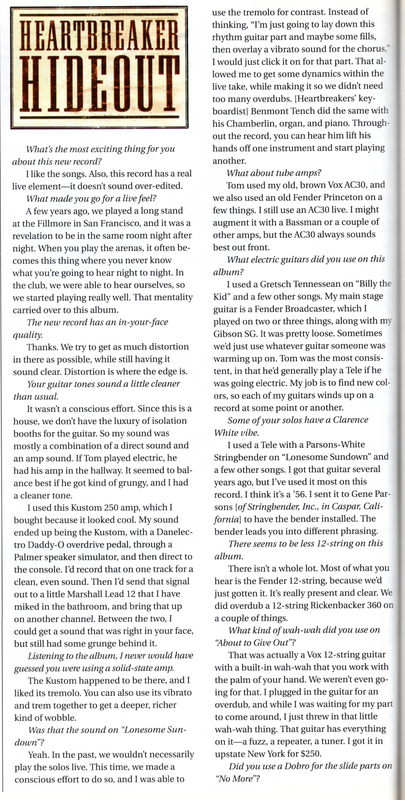 I played that low-down part on a Fender 12-string to illustrate where a solo might go, but I guess they liked it. Did you use a capo for the high acoustic parts on "Echo"? That was a combination of Scott Thurston [who plays guitar, harmonica, and other instruments with the Heartbreakers] playing a high-strung guitar, and he playing regular 6-string. As far as acoustics, I use a Gibson J-200, a Gibson Everly Brothers model, and this custom guitar that Gibson gave me at the Hollywood Bowl several years ago. [According to the Heartbreakers' longtime gear guru Alan Weidel -- a.k.a. "Bugs" -- this is a customized J-200.] I also use the blonde Rickenbacker 360 12-string that I've had since the start. My main electrics are a Rickenbacker 6-string [a custom 320/1997 model] and a Telecaster. I usually play the Rickenbacker with a capo. Your main Tele is a custom instrument, right? Yeah. I got it in '81 at Norman's Rare Guitars [in Reseda, California]. Norm said, "Take it home and tell me what you think." I haven't stopped playing it since. A master craftsman named Toru built it [Toru Nittono of L.A. Guitar Works in Reseda]. I don't know whether he used old components or what, because this guitar looks like an old Tele -- same pickups, same tailpiece. So you prefer it to a vintage Tele? I've had people bring 20 vintage Telecasters to rehearsals, and I'd play them all trying to find one that matches this one. 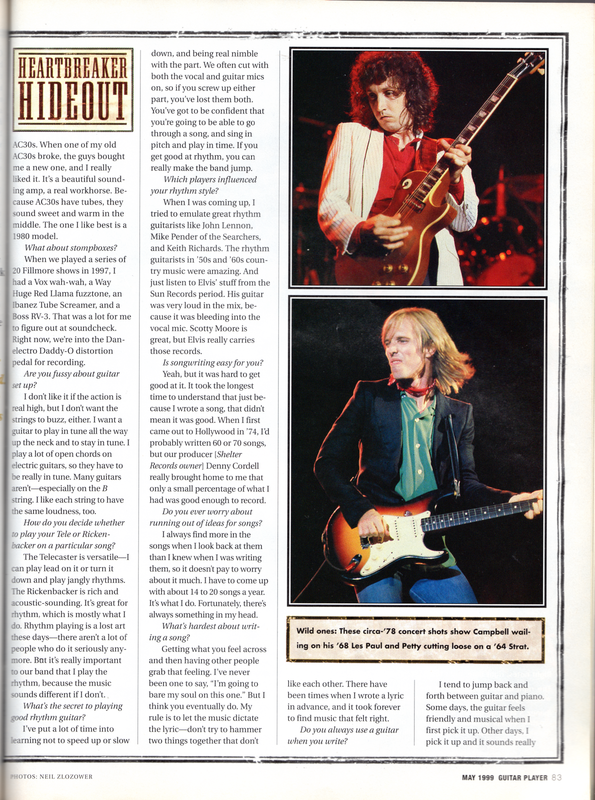 The closest I got was an old Esquire, which I bought for a spare. But if I ever lost my main Tele, I'd die -- it's so good. Toru even tried to make me another one, but it didn't sound nearly as good. Now it adorns the wall of some Hard Rock Cafe! Onstage, do you run your Tele and Rickenbacker through different amps? I switched between a Vox AC30 and a '65 Fender Bassman. I use the Bassman for dirtier sounds, and the Vox for cleaner things. I can also kick on a Fender Leslie speaker that's hooked up to both amps. Were you always an AC30 fan? The band started out with all of us playing Vox Super Beatles. They were really loud, though, so we toned it down to AC30s. When one of my old AC30s broke, the guys bought me a new one, and I really liked it. It's a beautiful sounding amp, a real workhorse. Because AC30s have tubes, they sound sweet and warm in the middle. The one I like best is a 1980 model. 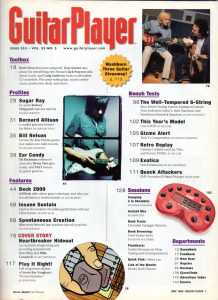 When we played a series of 20 Fillmore shows in 1997, I had a Vox wah-wah, a Way Huge Red Llama fuzztone, an Ibanez Tube Screamer, and a Boss RV-3. That was a lot for me to figure out at soundcheck. Right now, we're into the Danelectro Daddy-O distortion pedal for recording. 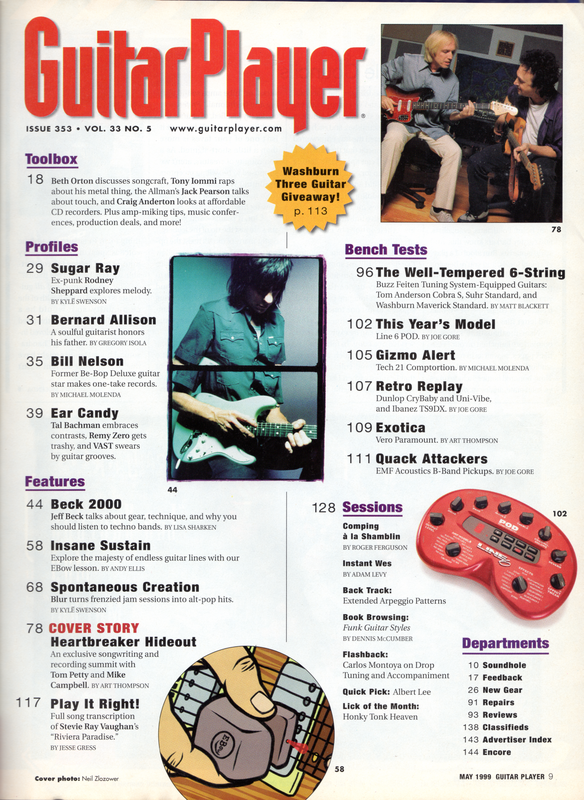 Are you fussy about guitar set up? I don't like it if the action is real high, but I don't want the strings to buxx, either. I want a guitar to play in tune all the way up the neck and to stay in tune. I play a lot of open chords on electric guitars, so they have to be really in tune. I like each string to have the same loudness, too. How do you decide whether to play your Tele or Rickenbacker on a particular song? The Telecaster is versatile -- I can play lead on it or turn it down and play jangly rhythms. The Rickenbacker is rich and acoustic-sounding. It's great for rhythm, which is mostly what I do. Rhythm playing is a lost art these days -- there aren't a lot of people who do it seriously anymore. But it's really important to our band that I play the rhythm, because the music sounds different if I don't. What's the secret to playing good rhythm guitar? I've put a lot of time into learning not to speed up or slow down, and being real nimble with the part. We often cut with both the vocal and guitar mics on, so if you screw up either part, you've lost them both. You've got to be confident that you're going to be able to go through a song, and sing in pitch and play in time. If you get good at rhythm, you can really make the band jump. Which players influenced your rhythm style? 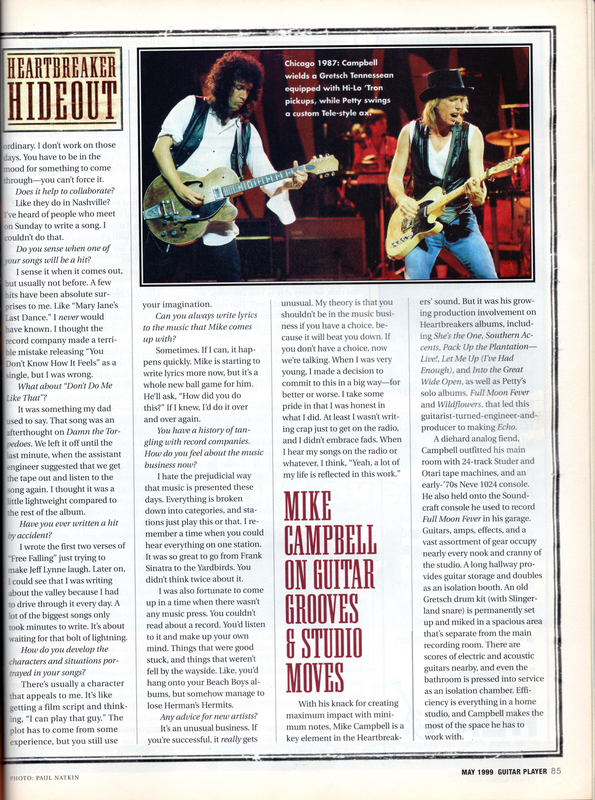 When I was coming up, I tried to emulate great rhythm guitarists like John Lennon, Mike Pender of the Searchers, and Keith Richards. The rhythm guitarists in '50s and '60s country music were amazing. And just listen to Elvis' stuff from the Sun Records period. His guitar was very loud in the mix, because it was bleeding into the vocal mic. Scotty Moore is great, but Elvis really carries those records. Is songwriting easy for you? Yeah, but it was hard to get good at it. It took the longest time to understand that just because I wrote a song, it didn't mean it was good. When I first came out to Hollywood in '74, I'd probably written 60 or 70 songs, but our producer [Shelter Records owner] Denny Cordell really brought home to me that only a small percentage of what I had was good enough to record. Do you ever worry about running out of ideas for songs? I always find more in the songs when I look back at them than I knew when I was writing them, so it doesn't pay to worry about it much. I have to come up with about 14 to 20 songs a year. It's what I do. Fortunately, there's always something in my head. What's hardest about writing a song? Getting what you feel across and then having other people grab that feeling. I've never been one to say, "I'm going to bare my soul on this one." But I think you eventually do. My rule is to let the music dictate the lyric -- don't try to hammer two things together that don't like each other. There have been times when I wrote a lyric in advance, and it took forever to find music that felt right. Do you always use a guitar when you write? I tend to jump back and forth between guitar and piano. Some days, the guitar feels friendly and musical when I first pick it up. Other days, I pick it up and it sounds really ordinary. I don't work on those days. You have to be in the mood for something to come through -- you can't force it. Does it help to collaborate? Like they do in Nashville? I've heard of people who meet on Sunday to write a song. I couldn't do that. Do you sense when one of your songs will be a hit? I sense it when it comes out, but not before. A few hits have been absolute surprises to me. Like "Mary Jane's Last Dance." I never would have known. I thought the record company made a terrible mistake releasing "You Don't Know How It Feels" as a single, but I was wrong. What about "Don't Do Me Like That"? It was something my dad used to say. That song was an afterthought on Damn the Torpedoes. We left it off until the last minute, when the assistant engineer suggested that we get the tape out and listen to the song again. I thought it was a little lightweight compared to the rest of the album. Have you ever written a hit by accident? I wrote the first two verses of "Free Falling" just trying to make Jeff Lynne laugh. Later on, I could see that I was writing about the valley because I had to drive through it every day. A lot of the biggest songs only took minutes to write. It's about waiting for that bolt of lightning. How do you develop the characters and situations portrayed in your songs? There's usually a character that appeals to me. It's like getting a film script and thinking, "I can play that guy." The plot has to come from some experience, but you still use your imagination. Can you always write lyrics to the music that Mike comes up with? Sometimes. If I can, it happens quickly. Mike is starting to write lyrics more now, but it's a whole new ball game for him. He'll ask, "How did you do this?" If I knew, I'd do it over and over again. You have a history of tangling with record companies. How do you feel about the music business now? I hate the prejudicial way that music is presented these days. Everything is broken down into categories, and stations just play this or that. I remember a time when you could hear everything on one station. It was so great to go from Frank Sinatra to the Yardbirds. You didn't think twice about it. I was also fortunate to come up in a time when there wasn't any music press. You couldn't read about a record. You'd listen to it and make up your own mind. Things that were good stuck, and things that weren't fell by the wayside. Like, you'd hang onto your Beach Boys albums, but somehow manage to lose Herman's Hermits. It's an unusual business. If you're successful, it really gets unusual. My theory is that you shouldn't be in the music business if you have a choice, because it will beat you down. If you don't have a choice, now we're talking. When I was very young, I made a decision to commit to this in a big way -- for better or for worse. I take some pride in that I was honest in what I did. At least I wasn't writing crap just to get on the radio, and I didn't embrace fads. When I hear my songs on the radio or whatever, I think, "Yeah, a lot of my life is reflected in this work." 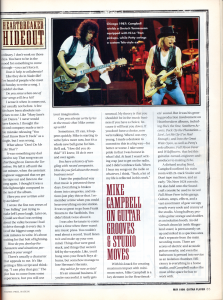 With his knack for creating maximum impact with minimum notes, Mike Campbell is a key element in the Heartbreakers' sound. But it was his growing production involvement on Heartbreakers' albums, including She's The One, Southern Accents, Pack Up The Plantation -- Live!, Let Me Up (I've Had Enough), and Into the Great Wide Open, as well as Petty's solo albums, Full Moon Fever and Wildflowers, that led this guitarist-turned-engineer-and-producer to making Echo. A diehard analog fiend, Campbell outfitted his main room with 24-track Studer and Otari tape machines, and an early-'70s Neve 1024 console. 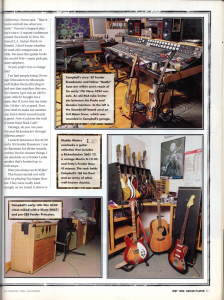 He also held onto the Soundcraft console he used to record Full Moon Fever in his garage. 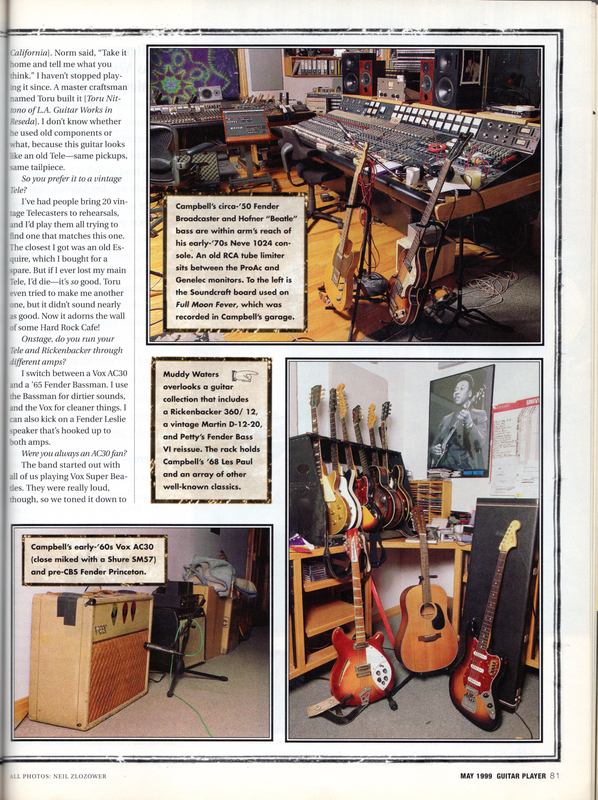 Guitars, amps, effects, and a vast assortment of gear occupy nearly every nook and cranny of the studio. A long hallway provides guitar storage and doubles as an isolation booth. An old Gretsch drum kit (with Slingerland snare) is permanently set up and miked in a spacious area that's seperate from the main recording room. There are scores of electric and acoustic guitars nearby, and even the bathroom is pressed into service as am isolation chamber. Efficiency is everything in a home studio, and Campbell makes the most of the space he has to work with. What's the most exciting thing for you about this new record? I like the songs. Also, this record has a real live element -- it doesn't sound over-edited. What made you go for a live feel? A few years ago, we played a long stand at the Fillmore in San Francisco, and it was a revelation to be in the same room night after night. When you play the arenas, it often becomes this thing where you never know what you're going to hear night to night. In the club, we were able to hear ourselves, so we started playing really well. That mentality carried over to this album. The new record has an in-your-face quality. Thanks. We try to get as much distortion in there as possible, while still having it sound clear. Distortion is where the edge is. Your guitar tones sound a little cleaner than usual. It wasn't a conscious effort. Since this is a house, we don't have the luxury of isolation booths for the guitar. So my sound was mostly a combination of direct sound and an amp sound. If Tom played electric, he had his amp in the hallway. It seemed to balance best if he got kind of grungy, and I had a cleaner tone. I used this Kustom 250 amp, which I bought because it looked cool. My sound ended up being the Kustom, with a Danelectro Daddy-O overdrive pedal, through a Palmer speaker simulator, and then direct to the console. I'd record that on one track for a clean, even sound. Then I'd send that signal out to a little Marshall Lead 12 that I have miked in the bathroom, and bring that up on another channel. Between the two, I could get a sound that was right in your face, but still had some grunge behind it. Listening to the album, I never would have guessed you were using a solid-state amp. The Kustom happened to be there, and I liked its tremolo. You can also use its vibrato and trem together to get a deeper, richer kind of wobble. Was that the sound on "Lonesome Sundown"? Yeah. In the past, we wouldn't necessarily play the solos live. This time, we made a conscious effort to do so, and I was able to use the tremolo for contrast. Instead of thinking, "I'm just going to lay down this rhythm guitar part and maybe some fills, then overlay a vibrato sound for the chorus," I would just click it on for that part. That allowed me to get some dynamics within the live take, while making it so we didn't need too many overdubs. [Heartbreakers keyboardist] Benmont Tench did the same with his Chamberlin, organ, and piano. 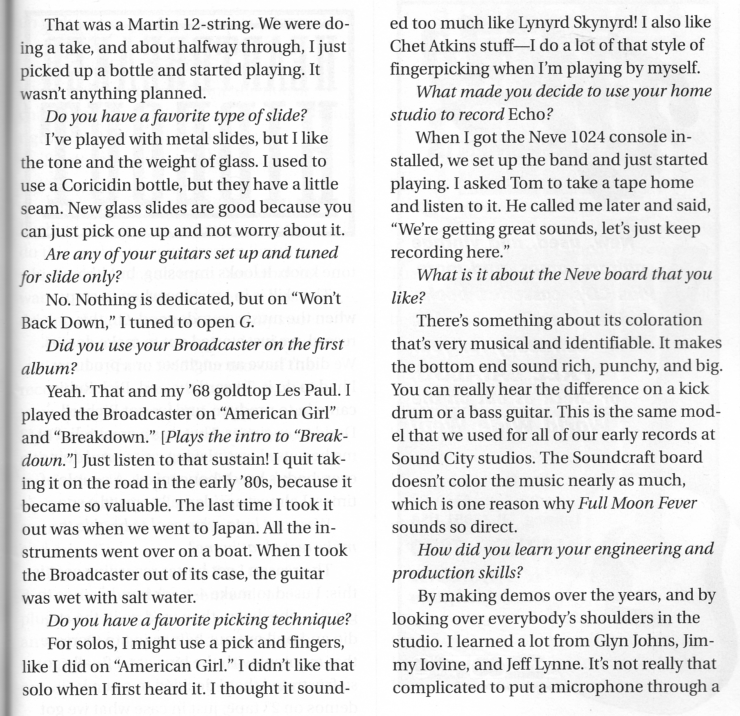 Throughout the record, you can hear him lift his hands off one instrument and start playing another. Tom used my old, brown Vox AC30, and we also used an old Fender Princeton on a few things. I still use an AC30 live. I might augment it with a Bassman or a couple of other amps, but the AC30 always sounds best out front. What electric guitars did you use on this album? I used a Gretsch Tennessean on "Billy the Kid" and a few other songs. My main stage guitar is a Fender Broadcaster, which I played on two or three things, along with my Gibson SG. It was pretty loose. Sometimes we'd just use whatever guitar someone was warming up on. 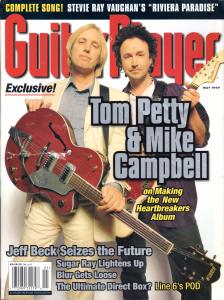 Tom was the most consistent, in that he's generally play a Tele if he was going electric. My job is to find new colors, so each of my guitars winds up on a record at some point or another. Some of your solos have a Clarence White vibe. I used a Tele with a Parsons-White Stringbender on "Lonesome Sundown" and a few other songs. I got that guitar several years ago, but I've used it mostly on this album. I think it's a '56. I sent it to Gene Parsons [of Stringbender, Inc., in Caspar, California] to have the bender installed. The bender leads you into different phrasing. There seems to be less 12-string on this album. There isn't a whole lot. Most of what you hear is the Fender 12-string, because we'd just gotten it. It's really present and clear. We did overdub a 12-string Rickenbacker 360 on a couple of things. What kind of wah-wah did you use on "About to Give Out"? 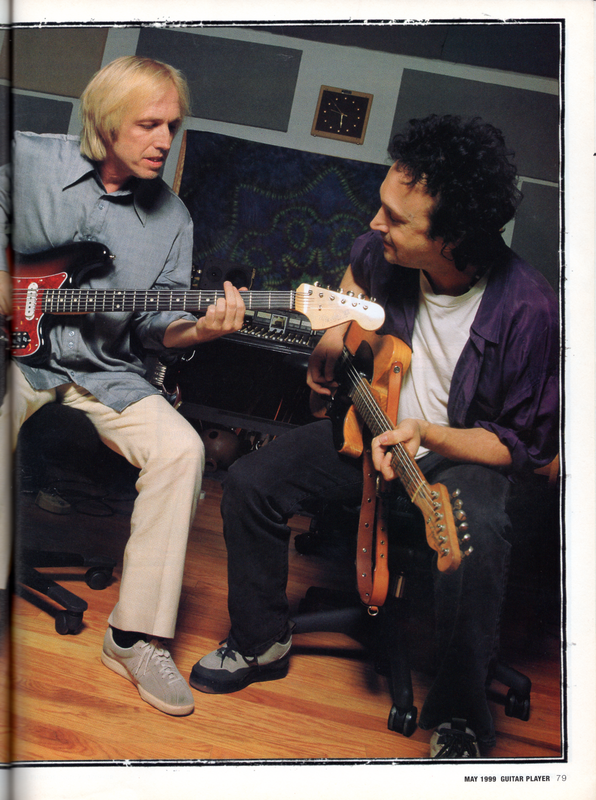 That was actually a Vox 12-string guitar with a built-in wah-wah that you work with the palm of your hand. We weren't even going for that. I plugged in the guitar for an overdub, and while I was waiting for my part to come around, I just threw in that little wah-wah thing. That guitar has everything on it -- a fuzz, a repeater, a tuner. I got it in upstate New York for $250. Did you use a Dobro for the slide parts on "No More"? That was a Martin 12-string. We were doing a take, and about halfway through, I just picked up a bottle and started playing. It wasn't anything planned. Do you have a favorite type of slide? I've played with metal slides, but I like the tone and weight of glass. I used to use a Coricidin bottle, but they have a little seam. New glass slides are good because you can just pick one up and not worry about it. Are any of your guitars set up and tuned for slide only? No. Nothing is dedicated, but on "Won't Back Down," I tuned to Open G.
Did you use your Broadcaster on the first album? Yeah. That and my '68 goldtop Les Paul. I played the Broadcaster on "American Girl" and "Breakdown." [Plays the intro to "Breakdown."] Just listen to that sustain! I quit taking it on the road in the early '80s, because it became so valuable. The last time I took it out was when we went to Japan. All the instruments went over on a boat. When I took the Broadcaster out of its case, the guitar was wet with salt water. Do you have a favorite picking technique? 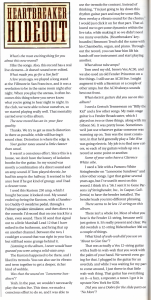 For solos, I might use a pick and fingers, like I did on "American Girl." I didn't like that solo when I first heard it. I thought it sounded too much like Lynyrd Skynyrd! I also like Chet Atkins stuff -- I do a lot of that style of fingerpicking when I'm playing by myself. What made you decide to use your home studio to record Echo? When I got the Neve 1024 console installed, we set up the band and just started playing. I asked Tom to take a tape home and listen to it. He called me later and said, "We're getting great sounds, let's just keep recording here." What is it about the Neve board that you like? There's something about its coloration that's very musical and identifiable. It makes the bottom end sound rich, punchy, and big. You can really hear the difference on a kick drum or a bass guitar. This is the same model that we used for all of our early records at Sound City studios. The Soundcraft board doesn't color the music nearly as much, which is one reason why Full Moon Fever sounds so direct. How did you learn your engineering and production skills? By making demos over the years, and by looking over everybody's shoulders in the studio. 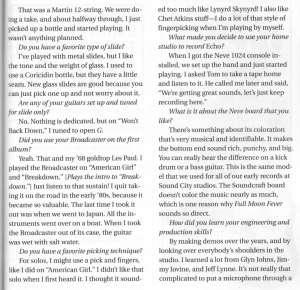 I learned a lot from Glyn Johns, Jimmy Iovine, and Jeff Lynne. It's not really that complicated to put a microphone through a tone knob. It looks imposing, but it's not. The skill is knowing when to stop when the music sounds good. On this record, we just started out to make demos. We didn't have an engineer or a producer, so I had to do it. 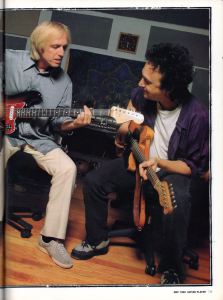 Toward the end, Rick Rubin came in to produce, and we got Richard Dodd to engineer. That was a great relief to me because I was playing guitar and doing everybody's headphone mixes. A couple of times, I almost accidentally erased a song. Was your long-term goal to be able to make records at home? 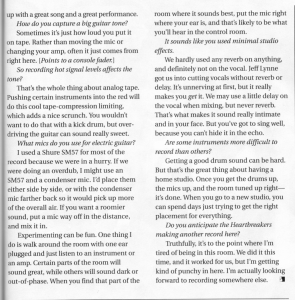 The reason I got better recording gear is this: I used to make 4-track band demos to get the vibe down, then we'd go into the studio and pull out our hear trying to recreate that moment with the big gear. I finally got so frustrated that I decided to put my demos on 2" tape, just in case what we got was the one. Because the clock's not running, you're free to experiment and create without feeling that, "Well, this cost us $2,000 today, and all we did was play around with guitar sounds." It's liberating to work at your own speed. Do you spend much time working on instrument sounds before recording? No, I don't spend a whole lot of time with tones. Usually I'm fiddling with songs. The way I look at it, anybody can get a sound. If you have a good guitar and a good mic, you can get a sound. To me, it's not mysterious. But to have something worth playing, that's what's really hard. We concentrate on coming up with a great song and a great performance. How do you capture a big guitar tone? So recording hot signal levels affects the tone? That's the whole thing about analog tape. Pushing certain instruments into the red will do this cool tape-compression limiting, which adds a nice scrunch. You wouldn't want to do that with a kick drum, but overdriving the guitar can sound really sweet. What mics do you use for electric guitar? I used a Shure SM57 for most of the record because we were in a hurry. If we were doing an overdub, I might use an SM57 and a condensor mic. I'd place them either side by side, or with the condensor mic farther back so it would pick up more of the overall air. If you want a roomier sound, put a mic way off in the distance, and mix it in. Experimenting can be fun. One thing I do is walk around the room with one ear plugged and just listen to an instrument or an amp. Certain parts of the room will sound great, while others will sound dark of out-of-phase. When you find that part of the room where it sounds best, put the mic right where your ear is, and that's likely to be what you'll hear in the control room. It sounds like you used minimal studio effects. We hardly used any reverb on anything, and definitely not on the vocal. Jeff Lynne got us into cutting vocals without any reverb or delay. It's unnerving at first, but it really makes you get it. We may use a little delay on the vocal when mixing, but never reverb. That's what makes it sound really intimate and in your face. But you've got to sing well, because you can't hide it in the echo. Are some instruments more difficult to record than others? Getting a good drum sound can be hard. But that's the great thing about having a home studio. Once you get the drums up, the mics up, and the room tuned up right -- it's done. When you go to a new studio, you can spend days just trying to get the right placement for everything. 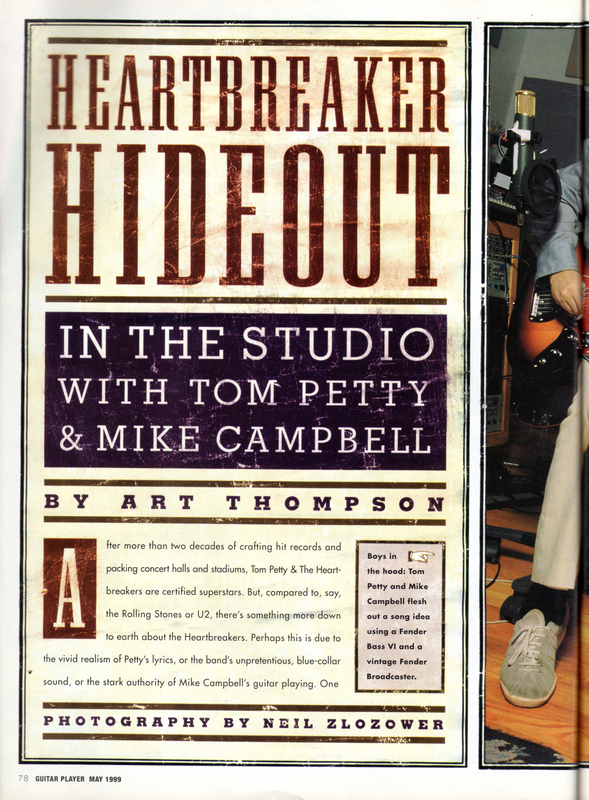 Do you anticipate the Heartbreakers making another record here? Truthfully, it's to the point where I'm tired of being in this room. We did it this time, and it worked for us, but I'm getting kind of punchy in here. I'm actually looking forward to recording somewhere else.